I know somewhere there’s an Italian person cringing at the thought of Tofu and Vegetables in a CALZONE!!! Sorry dude, my family can’t get enough of this stuff. I started making this years ago during the height of my family’s vegetarianism. Though we are no longer vegetarians, I still cook like one for the most part. We eat only chicken, but I don’t even cook that at home very often. I usually save the Chicken for my Nigerian Stew (which is just not the same any other way) or for when I go out with friends. I only occasionally cook chicken, simply because I don’t like working with raw chicken. 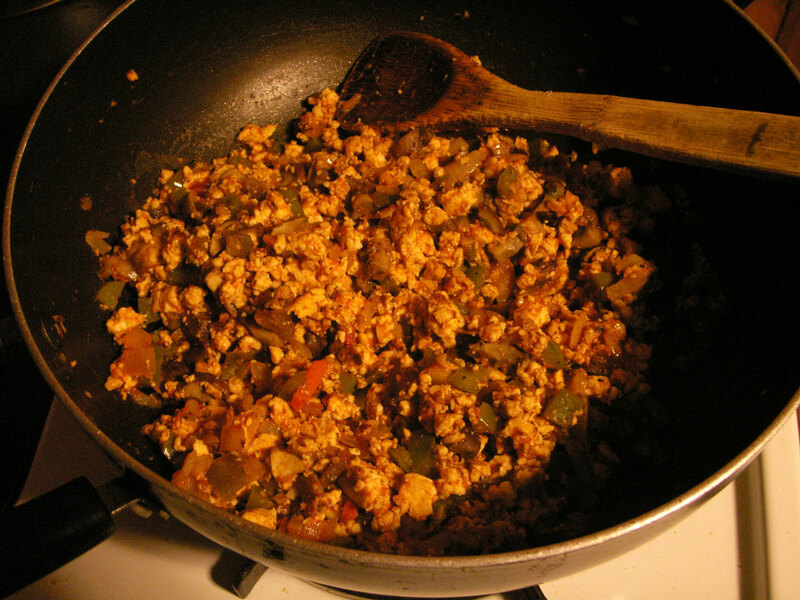 We do like our vegetables, and I actually LOVE tofu, as do my kids, so I use that often. This has been a favorite in my household for years now. 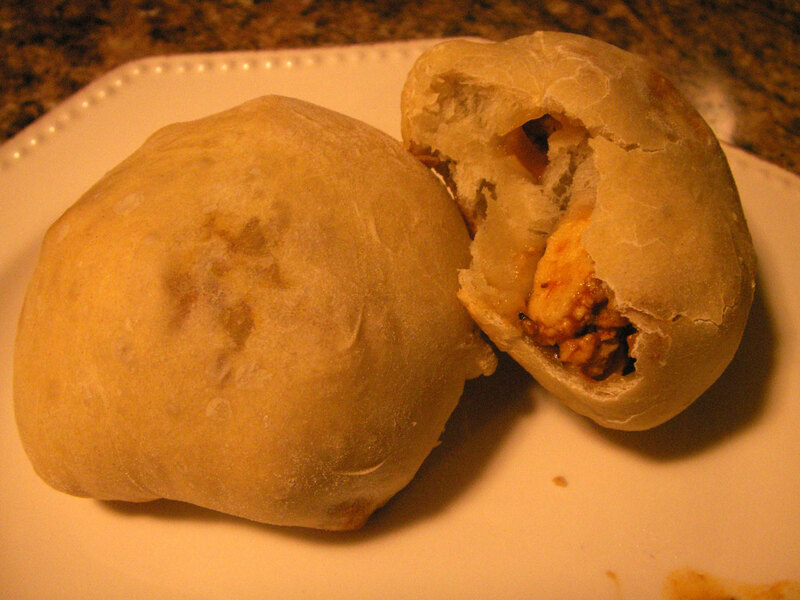 In my household it’s actually known as “Favorite Rolls” not Calzones. I just now got it to where it’s not quite so labor intensive and time-consuming as it once was. Thank goodness for Trader Joe’s! Really good ingredients at really reasonable prices! 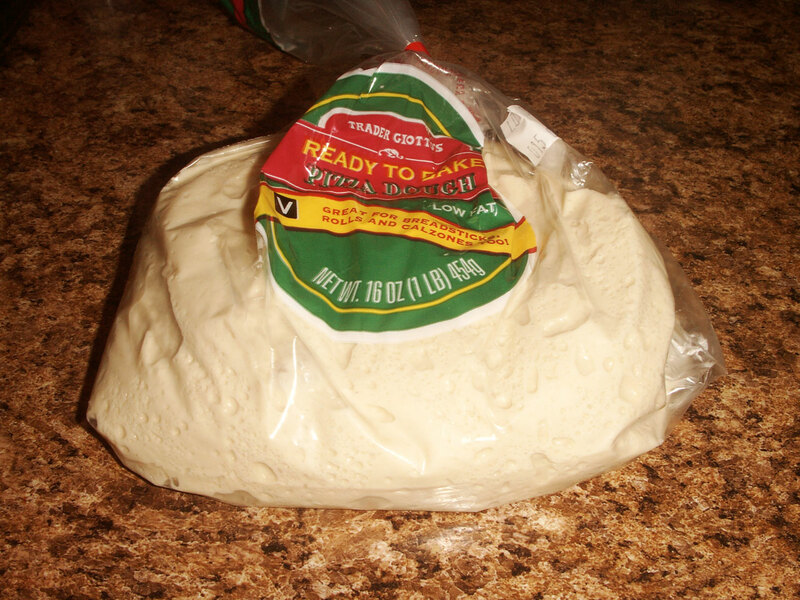 I get the pizza dough from there for 99cents, and that shaves off a huge amount of prep. To think that I used to make pizza crust from scratch. Que’lle Horreur! Don’t be scared! True, it doesn’t have a flavor/taste of its own, but that’s what makes it so good to work with. It will absorb whatever flavor you want it to. It is a literally a flavor sponge. Use whatever spices you want. In this recipe I use an italian spice blend. This isn’t so much a recipe as a guideline. This isn’t like pastry baking, where everything has to be exact. Cooking is more forgiving. Use your own combination of fillings if you’d like. If you use everything in the pictures as I’ve used, you should end up with about at least 13 small calzones, depending on how filled each one is. If you have issues, leave a comment below, and I’ll help you out. 2. Get your vegetables together. Everything I put into my filling is below. The only thing not pictured is the spice mix and salt. Everything is to your taste. I use italian spices. 3. 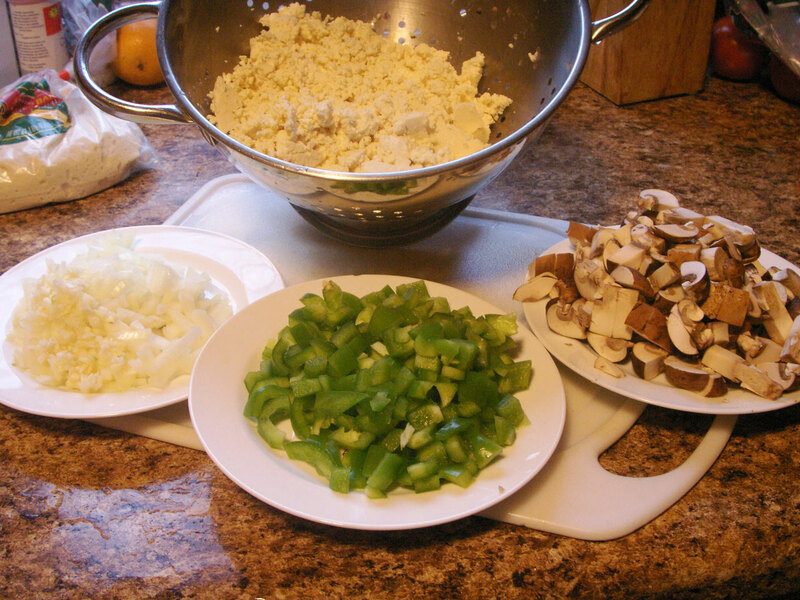 Here are the veggies all chopped up. Make sure to crumble up the tofu into a colander. You want to drain out as much water as possible because the vegetables will also ooze water into your filling mix. A ‘too wet’ filling mix will make your calzone soggy, yuck. 4. I usually saute/pan fry the tofu first (with a little oil) until it gets a light brown crust on it. This is to further reduce the water content. 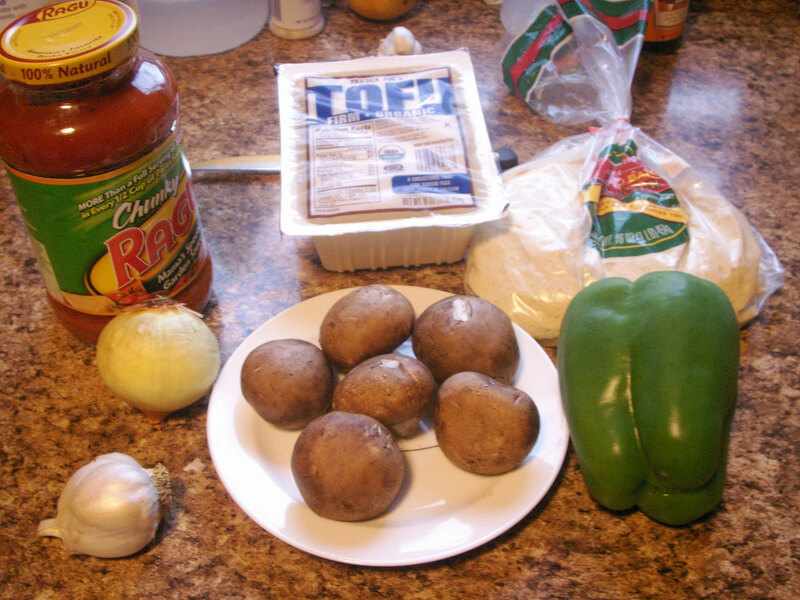 Then I add the onions and garlic, saute a couple more minutes, then add the rest of the veggies and spices/salt. Another couple more minutes, then I add the Ragu spaghetti sauce and let the flavors marry for about 10-15 minutes, stirring the whole time. This is what it looks like when it’s ready to go. 5. After the filling’s done, I let it cool down for a little while because if you fill while the filing is piping hot, you could make holes in your dough. For this reason, it’s a good idea (when possible to make the filling a little bit ahead of when you want to fill the dough. I then spread out the dough onto a floured surface and roll w/a rolling pin. 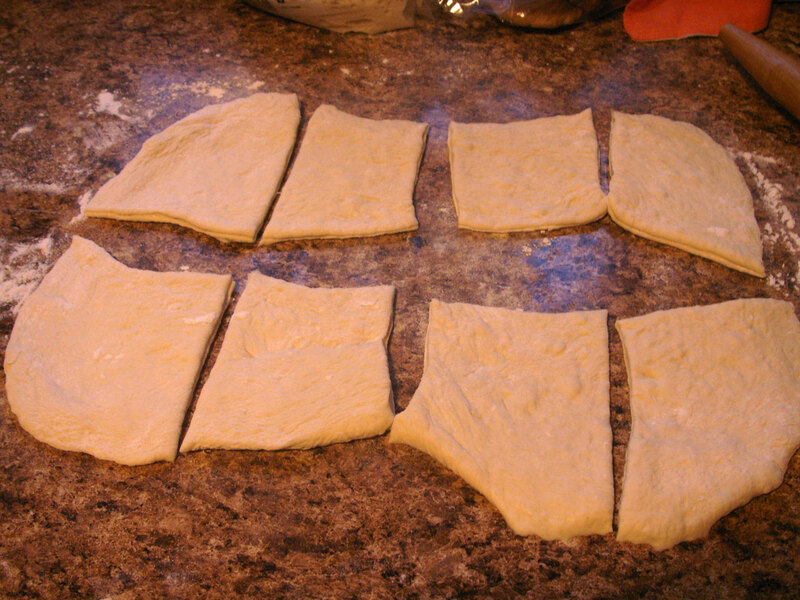 I use a pizza wheel (or knife) to cut the dough into eight pieces like below. 6. 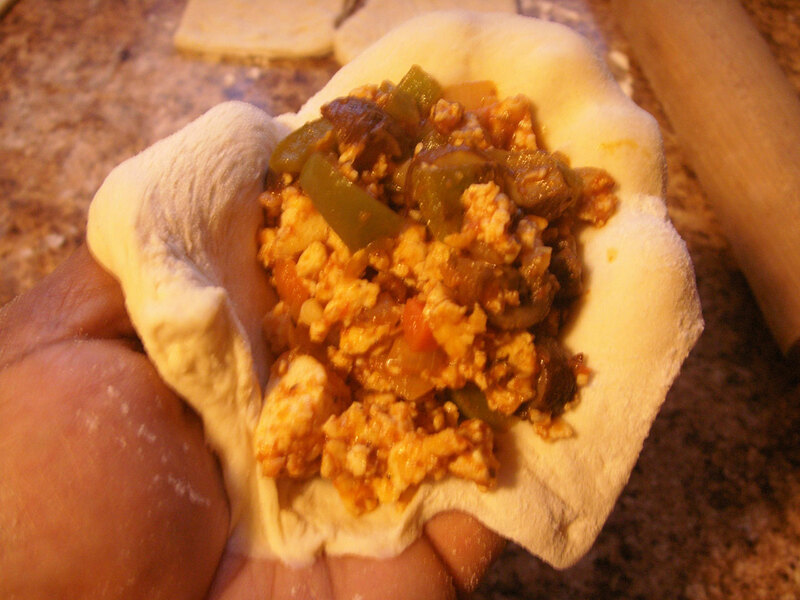 Lightly stretch out the dough (not too much, you don’t want it thin) and scoop some filling into each piece. 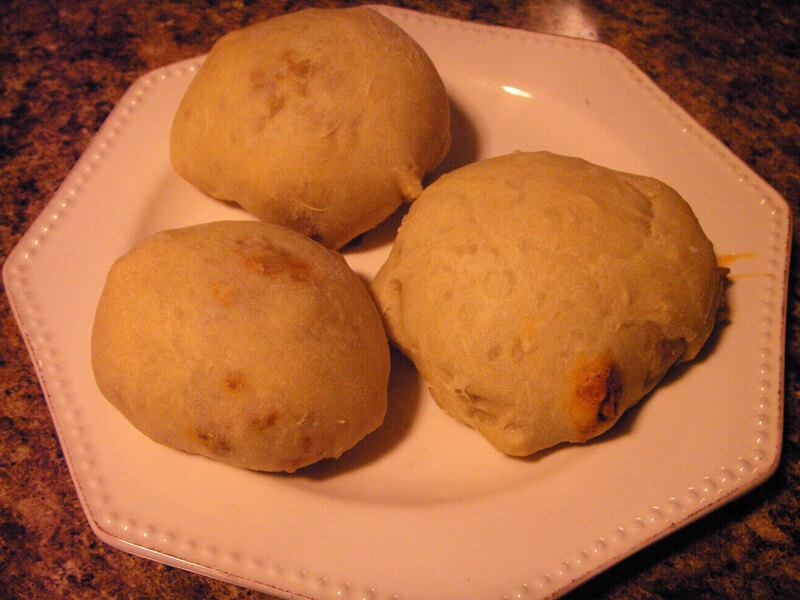 Roll up and place on a baking tray lined with parchment paper (or foil). Bake at 350deg, until lightly browned on top. 7. And Voila! Here it is, all ready to eat. 8. Here’s what the inside looks like if you break it apart. Yummy!